A vegetation fire prompted evacuations in Cambria Tuesday afternoon. But, firefighters managed to completely contain the blaze and limit the amount of area it burned to three acres. 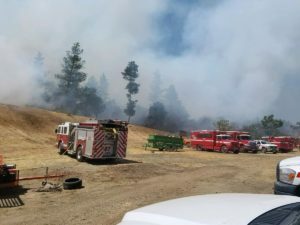 The blaze, which was dubbed the Bridge Fire, broke out around 1 p.m. in an area of eucalyptus and pine trees near Main Street and Bridge Street. Authorities evacuated nearby homes and businesses, but later lifted the evacuation orders. Firefighters stopped the forward spread of the fire by mid-afternoon. They remained on scene overnight mopping up hot spots. Officials have yet to determine the cause of the fire. The blaze remains under investigation. They were very lucky…remember when fire officials wanted to clear a fire break around Cambria and there was considerable opposition?